Keynote speaker Iain Boal is an Irish social historian of science, technics and the commons, with a particular interest in aesthetics, visual culture and questions of representation. Since moving to the US in 1982 he has worked at Harvard, Stanford, and the University of California at Berkeley and Santa Cruz, teaching the history of science, environmental politics, and community studies. In 2005/6 he was awarded a Guggenheim Fellowship in Science and Technology. He is currently affiliated with Birkbeck’s Institute of Humanities, and is co-director of the MayDay Rooms, an ‘archiving from below’ project based in London and San Francisco. He was a member of the Pumping Station Collective in Boston, and is associated with Retort, a group of antinomian writers, artisans, and artists based in the Bay Area. He is one of the co-authors – with T.J. Clark, Joseph Matthews and Michael Watts – of Retort’s Afflicted Powers: Capital and Spectacle in a New Age of War (Verso), and was involved in Retort’s installation at the 2nd Seville Biennial. In the late 60s he played bass with the fusion band Horn of Plenty, and recently has been on the road again with the Celtic fringe performance troupe The Wolf in Winter. He is co-editor of West of Eden: Communes and Utopia in Northern California (PM Press, 2012), and author of The Green Machine (Notting Hill Editions, 2012), a brief planetary history of the bicycle, and The Long Theft: Episodes in the History of Enclosure (Faber & Faber, forthcoming). [Photo by Sam Boal. 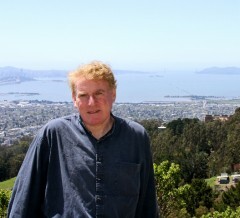 Iain Boal on the San Francisco littoral, view from Grizzly Peak Road, with Strawberry Canyon and Berkeley below, Alcatraz and the Golden Gate hazily visible beyond].